Camping World Congress If you thought Facebook's Beacon ad program had FAIL written all over it, wait until you see what Yahoo! has in store for you. Like Beacon, the new "OneConnect" program follows Web 2.0's logic to its natural conclusion – you see what everyone else is doing, even when you don't want to. 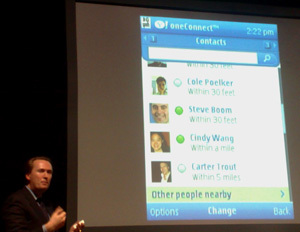 OneConnect is essentially a single sign-on to social networks such as Facebook and Bebo, web services like Twitter and IM services including MSN, and Yahoo! 's own chat. It then binds them to proximity information so you can see what everyone is "twittering", and how near to you they are. It then places your twittering pals on a map, so you can see their inane gibberings on your mobile phone. 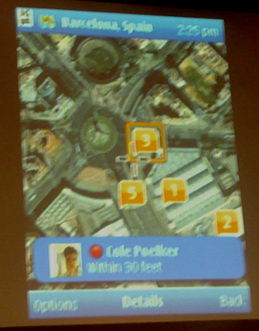 "I want to view the activity of people around me," explained Marco Boerries, Yahoo! 's mobile chief. That's easy enough to do, you're thinking - just look out of the window, Marco. OneConnect isn't just a "mash up" - it's the best thing to happen to stalkers since the invention of the dirty raincoat. Boerries defended the service by saying that it was "opt-in", and that when users signed on, they were invisible by default. But that misses the point: once you open your kimono, nothing is hidden. In doing so, Boerries admitted that there is no granularity between the "all" or "nothing" settings. Thus, OneConnect appeals to that peculiar mixture of cowardly lurker and neurotic exhibitionist who form the staple of Web 2.0's evangelicals, the people who've been crying out for this kind of service, and whose prayers were answered today. For these people, there is no such thing as privacy, for everything is an opportunity to commune with the "Hive Mind". The rest of us might find it a step too far, however. For example, my Yahoo! address book contains many people I've never met – and more with whom I've spoken fluent Ugandan. I don't want either group to know where I am today, thank you. But the possibilities are endless. I'm sure law enforcement officials would love to know the proximity and whereabouts of techies with rucksacks, and Microsoft the location of unauthorised copies of Windows. The BPI really would love to know what song you're playing, and where you acquired it. If you think all that's a bit far-fetched, read this. Which brings us to the fundamental error. Boerries thinks the service is great - "I can stay extremely connected to my friends". But successful technology isn't about connection. It succeeds when it allows us to put up barriers, and pick and choose how we interact with each other. That's something conspicuously lacking in OneConnect. Even by the anti-social logic of Web 2.0, OneConnect is fundamentally anti-social. People with a weak or fragile sense of their own identity love these web services, however - because they have nothing of interest they want to keep "private". Unfortunately, this is the Web 2.0 crowd, and in their twilight they try so very hard to set the agenda. Media companies without their own sense of identity listen to them. So by heeding the bleatings of this small contingent of scaredy-cat/show-off technology evangelists, Yahoo! has made the same mistake as Zuckerberg's Facebook, which with Beacon allowed everyone to see what we were buying: an unconstrained flow of information that the public found repellant. Gossip-oriented readers may be reminded of Gawker's rather outrageous 'Gawker Stalker' net jape, whereby sleb-spotters could post up sightings of notable types on a map, thus enabling minor flash-mobs of autograph hounds and rubberneckers. George Clooney fans rather amusingly spammed it in the face.